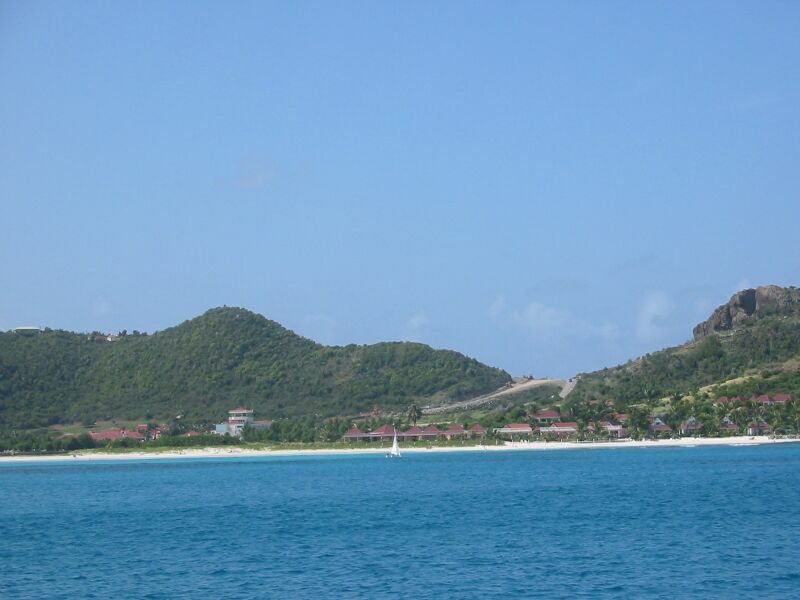 After our stay in St. Martin we sailed over to Gustavia, St. Barts. 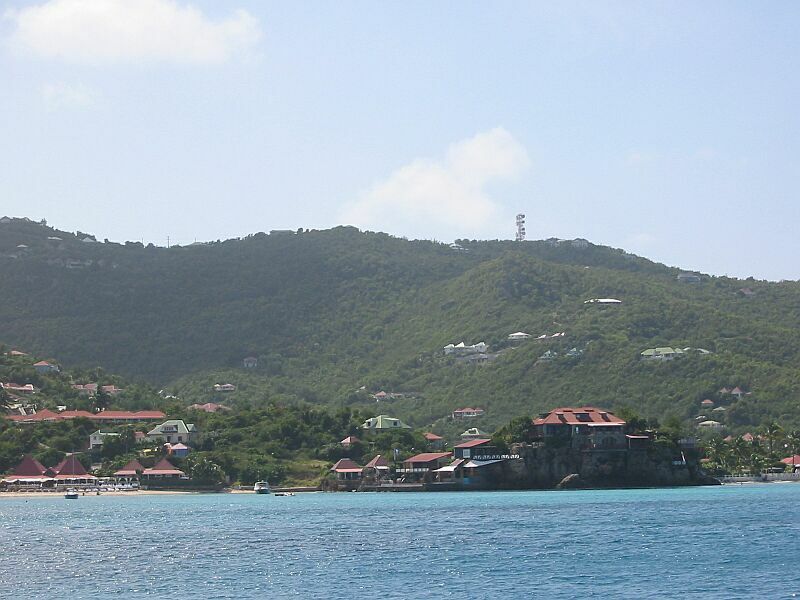 Only 12 miles separate the main island of St. Martin from St. Barts. However, we had to sail around from Marigot and against some wind and waves. So, it was about 35 miles for us. It was a wet bumpy ride as well with about 8-10 foot seas. But, we arrived by about 1:30 PM. Here's a photo of Hotel California sailing over the next wave. Both our boats did this for several hours. The night before, our girls spent the night on Hotel California with their friend Lindsey. They were offered the chance to stay on Hotel California for the passage to St. Barts - if they behaved. They did get to stay, but the aforementioned rough passage caused Catherine, and several others on Hotel California to lose the nice pancake breakfast they had eaten. PatiCat offered to hove to and take the twins back, but they decided to press on for the 4.5 hour trip. Frank had some success catching some fish on the way to St. Barts and also caught some odd fish (a Needlenose and a small Barracuda) in the anchorage. None were "keepers" though. The second picture shows the frustration one sometimes encounters - captioned: "Shucks, more seaweed!" :-). 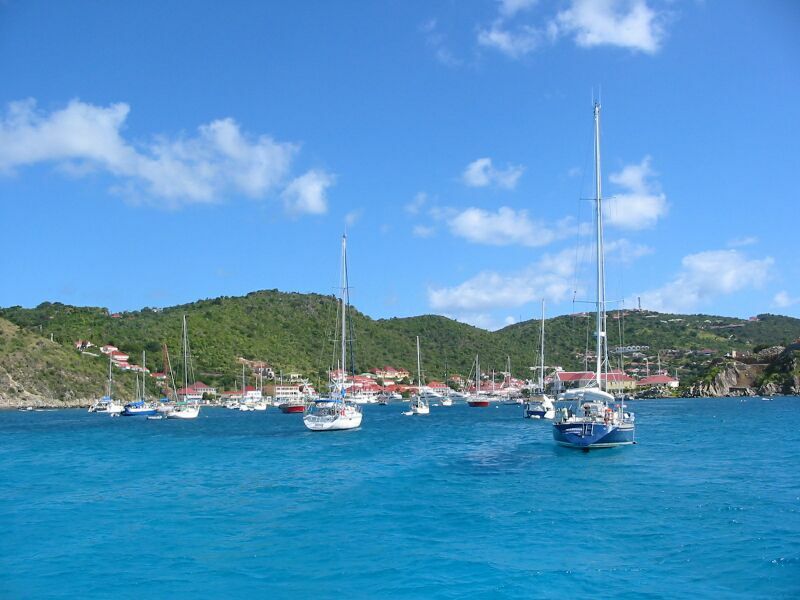 One of the first things we noticed on arrival into Gustavia, St. Barts was that the water in the port was the clearest we have seen in the Caribbean. 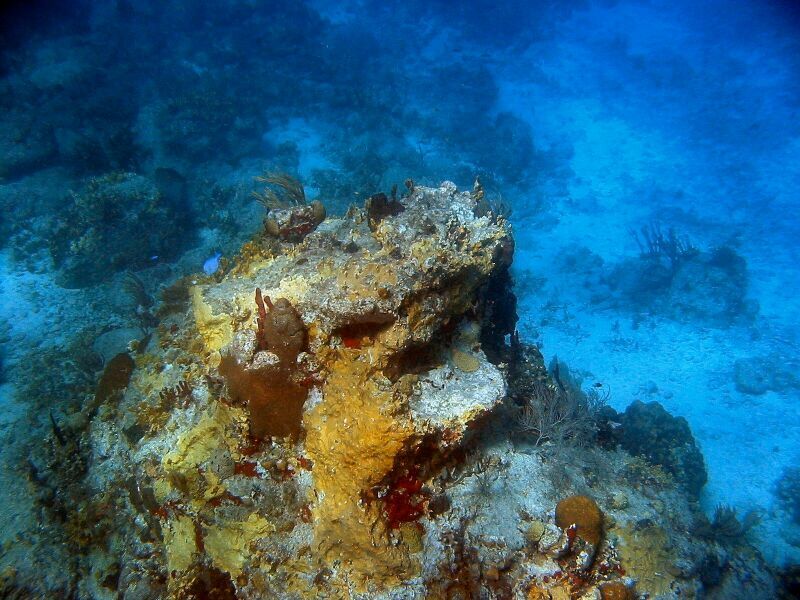 We could easily see the bottom 22 feet beneath our boat at our anchorage. Frank did a snorkel check of our bottom and saw three small nurse sharks sitting under the boat. He didn't bother them and they didn't bother him. But, the clarity was amazing. Customs was a straight forward and very professional process with a nice customs office right across from the dinghy dock. Definitely French however, and Euros were required to pay port fees - the first place which refused US Dollars from us. We had to go to an ATM to get some Euros. Here is a picture of Gustavia's port. 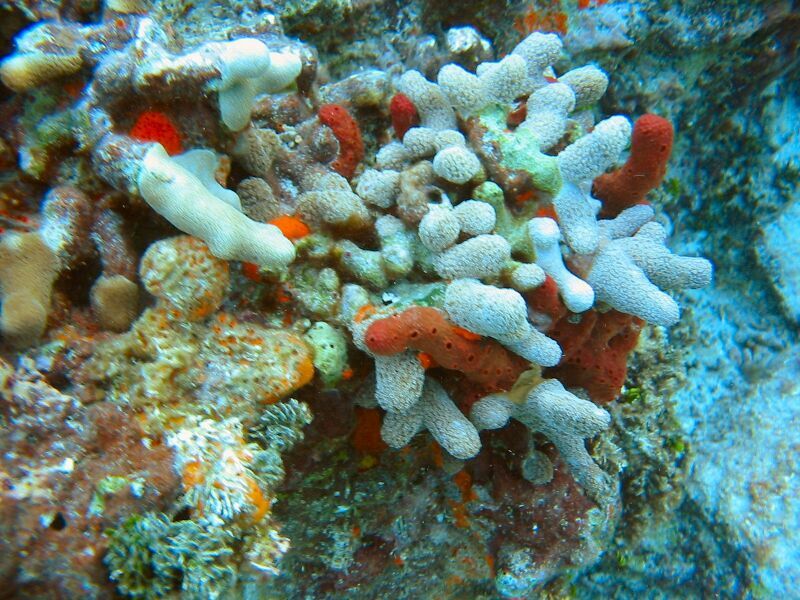 We had some great snorkelling (mostly due to the very clear water) at the Grotos near our anchorage in Gustavia. 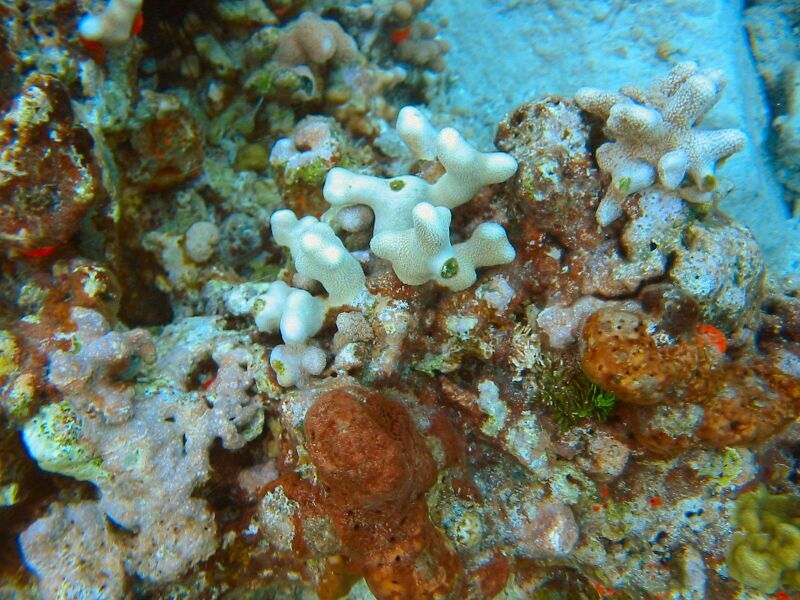 Frank took some nice underwater pictures while there, and here are a few sample photos. 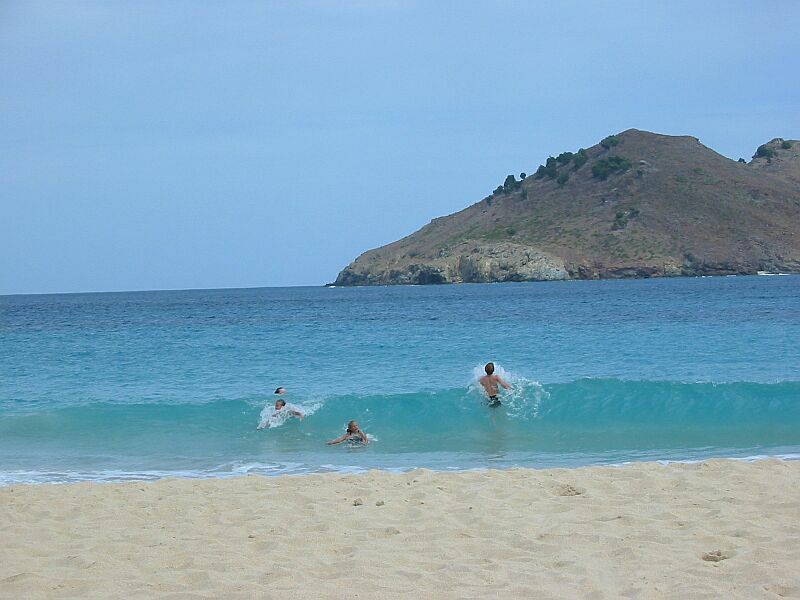 On January 6th we moved to Anse des Columbier, a nice bay on the NW side of St. Barts. They had nice mooring balls provided by the Marine Park Service and there was no charge to use them. This was a beautiful bay with a stone staircase up to some hills nearby which led to a nice hiking trail. 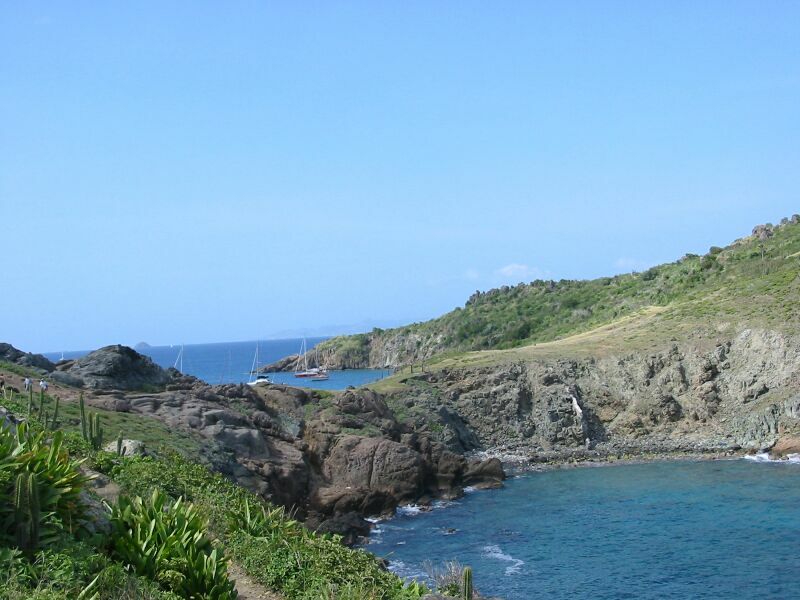 Hotel California's entire family and ours hiked the trail over to Anse des Flamandes - another nice bay about 2 miles away. The hike was georgeous with stupendous views from craggy volcanic rock formations, with incredible coral reefs below in clear turqouise waters. Waves were crashing against the rocky coastline with awesome displays of water and ocean spray. 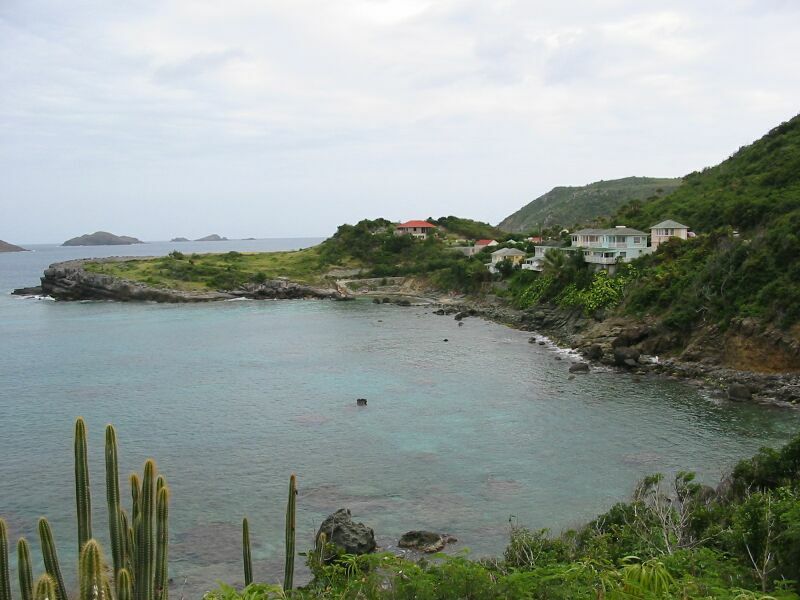 We really didn't appreciate how beautiful St. Barts is until we went to Anse des Columbier. Once in Anse des Flamandes we found a general store and bought some snacks. We then walked over to a nice sandy beach and did some swimming and relaxing on the beach. Finally we hiked back to our bay. 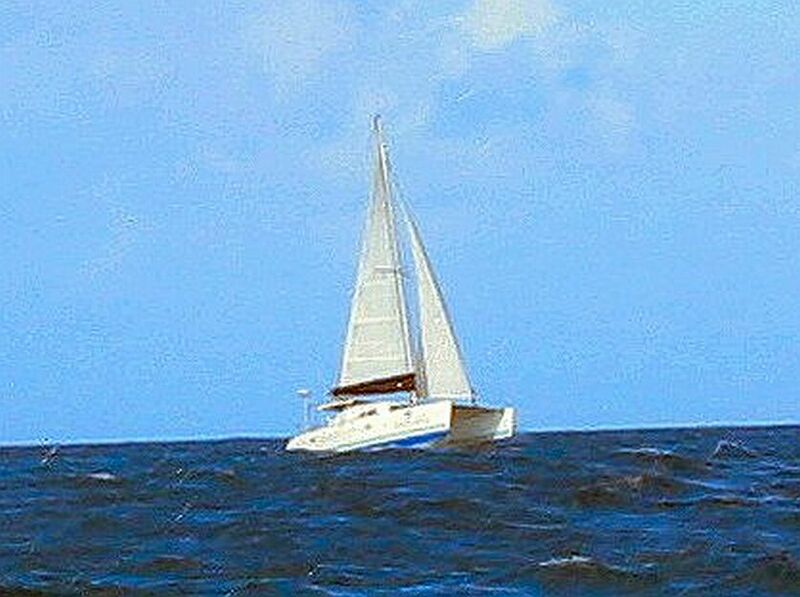 Later in the afternoon, this was January 7th, we let the kids swing off our spinnaker halyards and drop into the water. They spent several hours doing this, and had a blast. Here are some photos including a photo of the bay, of Hotel California at the mooring, views from the trail, a shot of all of us at the general store, a shot of the kids swimming at the beach, and some shots of the kids swinging from the boat. On January 8th we went back to Gustavia with plans to drop off laundry quickly and head back out. Well, it took a bit longer because we had to take a taxi to St. Jean to find a laundry service which could handle our loads (they had too much business already at most of them). We had to use a small laundrymat that would only wash and dry - no folding or sorting. Not as nice as the service we usually get down here. 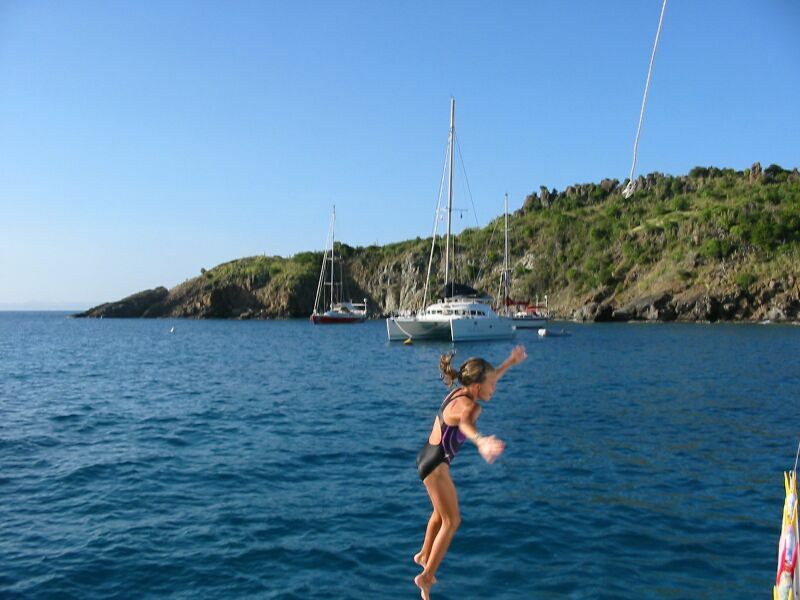 We finally got out of Gustavia after lunch and then moved our boats to Ile Forchue - a very rocky and barren island NW of St. Barts, but one with excellent diving and snorkeling. 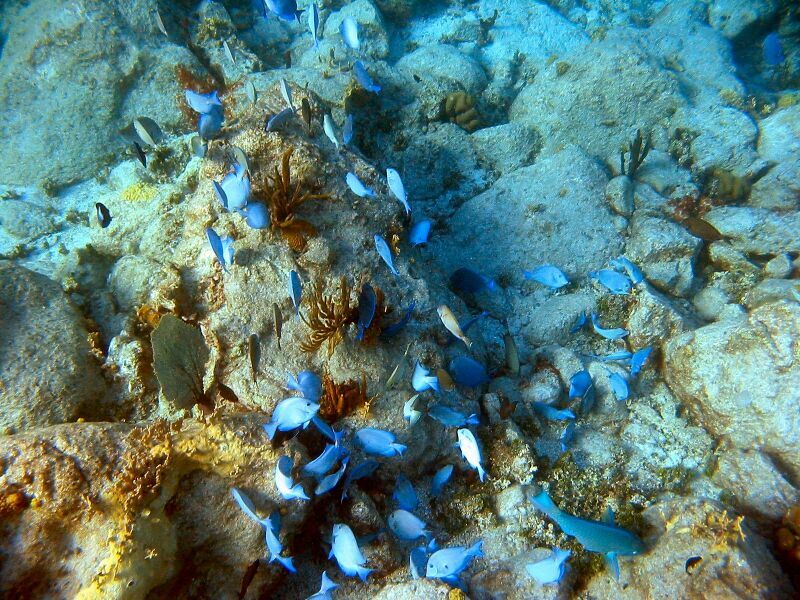 We did a quick snorkeling tour and then moved our boats again over to Baie St. Jean and dropped anchor outside the bay. We had to drop anchor outside the bay because the runway for the St. Barts airport runs right to the beach in the bay...the pilots probably don't like the idea of tall masts in their flight path. Fortunately the airport doesn't have any night flights, so we weren't awakened by any flights. 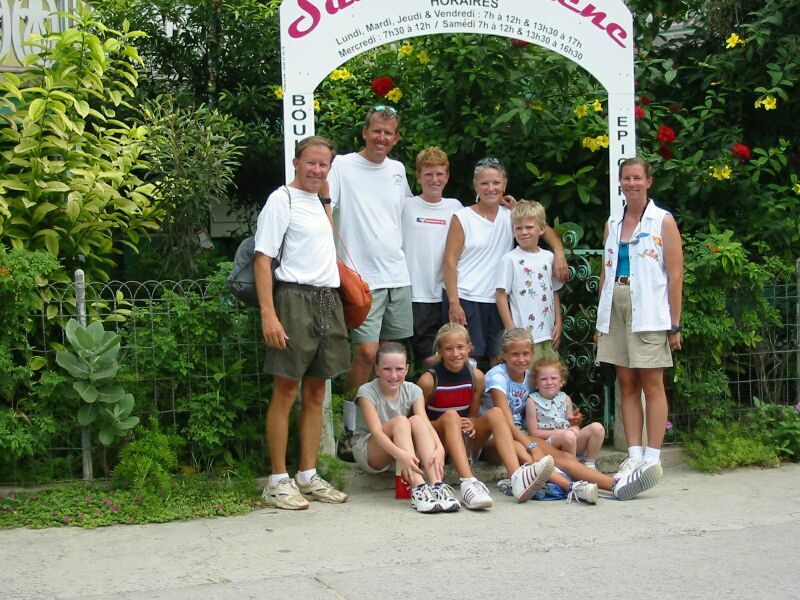 The Taylor family came over on the 8th to Hotel California to watch the kids so their parents could go out for dinner. For which the parents were very grateful. Frank gave some astronomy lessons to the oldest boy who needed it for a boy scout merit badge. Here are some photos of St. Jean Bay, the restaurant on the rock is Eden Rock Restaurant, and where the Walch's had dinner. The next day - January 9th, after morning homeschooling, we went ashore and walked to the airport area where our laundry was waiting. We found a nice grocery store while we were there. We got back to the boat and sorted the laundry and weighed anchor as the sun was beginning to set. 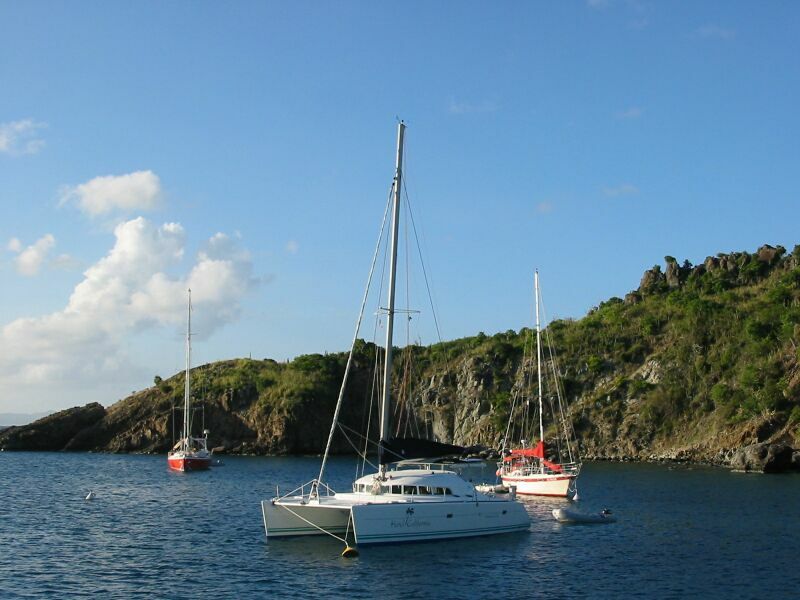 We planned to move back to Anse Columbier, but all the mooring balls were taken. So, we moved on over to Gustavia again. We arrived at nightfall, but had no problems setting our anchors as we were well familiar with the area. 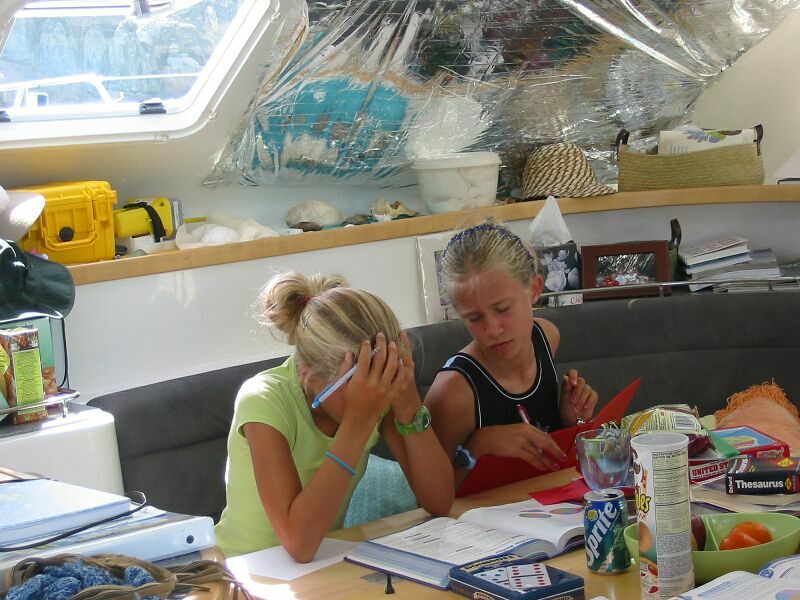 Here is a shot of the girls having a hard time with their schoolwork. Fortunately, it isn't always like this (for both the teachers and the kids). The girls went over to Hotel California while Frank and Karen went in for dinner this time. We had a nice meal at a French restaurant, which consisted of Tapas (appetizer sized portions), a glass of wine, and a bowl of warm sugary Plantains for dessert. 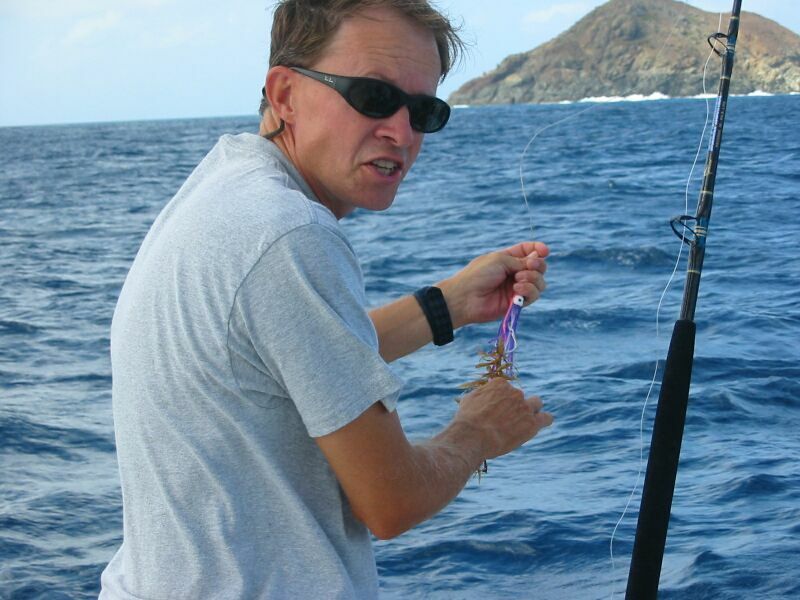 We were back before too late, and picked up the kids and we made plans for departing St. Barts for Saba the next day. 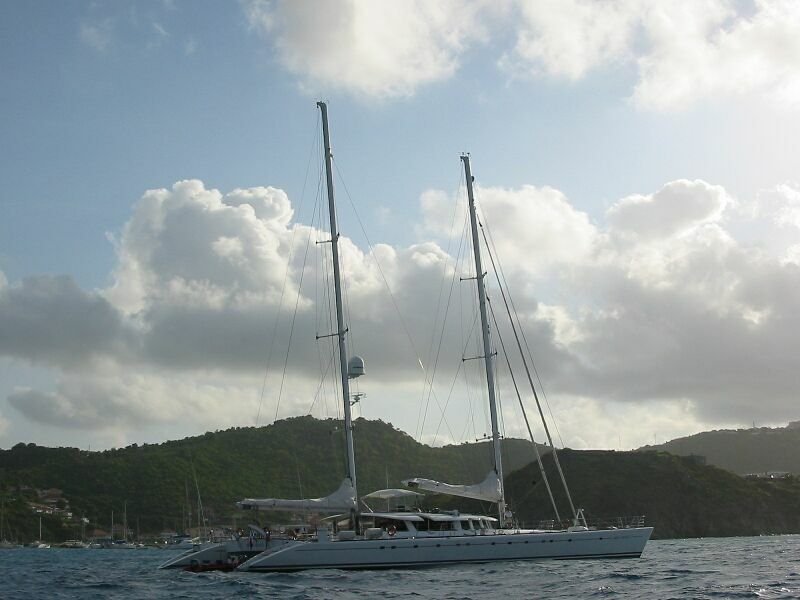 We also saw a nice "little" catamaran (about 90 feet) with two masts and luxurious accomodations with crew (of course). Here's a picture of the big cat. 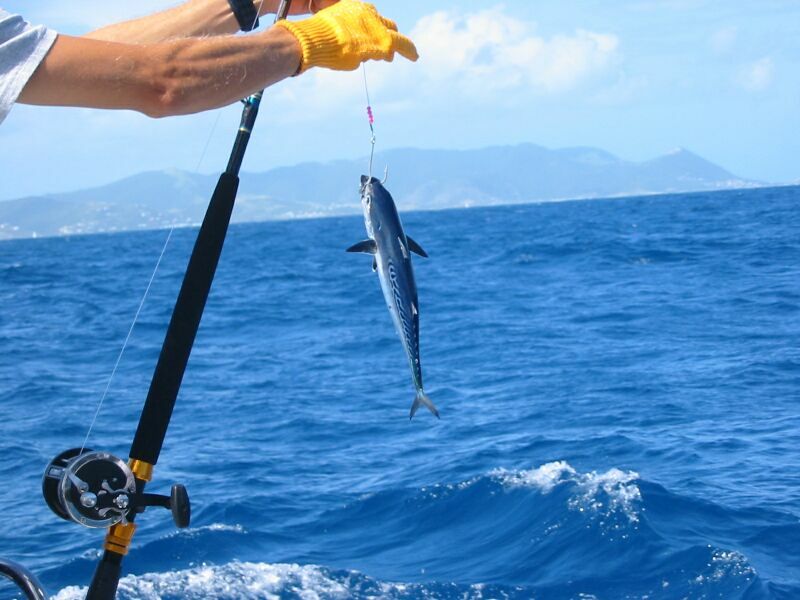 On Friday, January 10th, we cleared customs at 7:45 AM and departed for Saba. This time we had nice winds, and the seas were not too bad as they were off our port quarter. We averaged 8.5 knots the whole way - so we arrived at Saba in less than 3.5 hours.